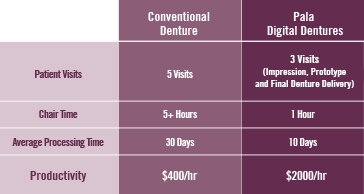 With Pala Digital Dentures, superior-quality dentures can be delivered to your lab in about ten business days. The greatest benefit of using the CAD/CAM is the reduction of patient visits. Patients take an initial impression of their gum on the first visit. Patients are called back to the office for a custom tray impression. Patients make a fourth visit for teeth prototypes and final processing. Patients receive the final and fitting denture during their fifth visit. On the other hand, Pala Digital Dentures requires ONLY 2 PATIENT VISITS (to take the impression and prototype evaluation) before final denture delivery. See for yourself. 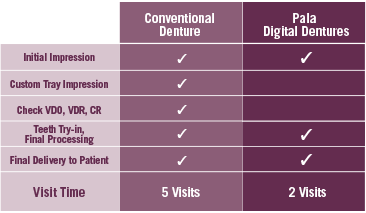 Order a Pala Digital Dentures Starter Kit today and share the advantages with your patients.